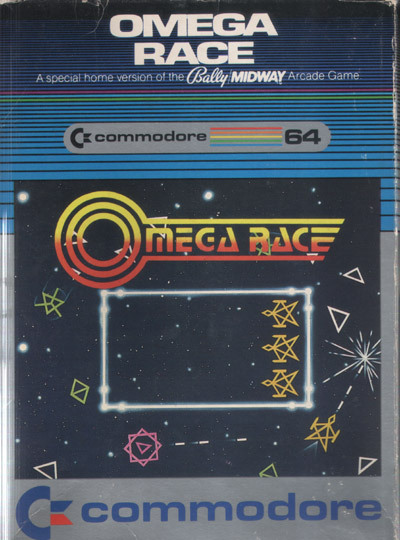 Omega Race is very similar to Asteroids, but with restrictions set for the player that improve game play. The restrictions work; this is one of the few clones that works very well in comparision to the original. Enough elements have been changed to make the game different enough from Asteroids to make it feel like anything but the same old thing. But what makes this game hold its own when compared to such a classic as Asteroids? One of the most noticeable differences between Omega Race and Asteroids is that the former does not allow the player to roam freely over the entire screen. There is a large box in the center that contains the player's score and the number of ships remaining. The playfield does not wrap; when the player's ship hits the side of the screen, it bounces off, rather than continuing on to the opposite side. This does take a bit of getting used to, but it actually adds to the game play rather than detracting from it. The arcade version uses buttons for maneuvering the little Vector ship, just like in Asteroids. The Atari 2600 version only allows the use of a wacky button controller made especially for the game. Since this controller is difficult to find, it is a good thing that the 64 translation allows for the choice between keyboard, paddle and joystick. Such is the luxury of 64k, I guess. Using keys to control the ship is difficult and quite frustrating. Although I have never played the arcade version, I don't imagine that the 64 keyboard is a close approximation of the original button layout. The joystick should be the best way to play, but it is only marginally better than keyboard control. Neither the keyboard nor the joystick make this game; read on. Years ago I found Omega Race to be fun, and I was quite good at it. I would compare my top scores to those in the Commodore magazines, and mine were right up there among the best. What was my secret? Paddles! Omega Race is definitely meant to be played with paddles. If you are someone who does not have paddle controllers, then you must get some if you plan on having a good time with this game. Anyone who plays with a joystick is missing out on the heightened control offered by this very well-done translation. -- Adam T.
Brought home from one of the most rarely encountered coin-ops is one of the more innovative "simple" engagements ever to throw the maze-game genre for a loop. The idea itself is easy to grasp yet utterly unique. 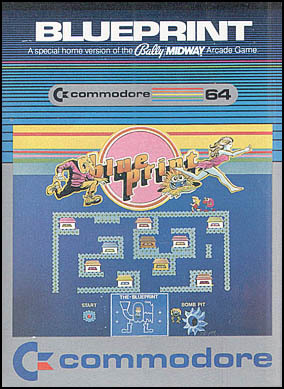 The actual implementation, as far as the C-64 version goes, is so-so, but it's still done well and fun to play. You wander a maze of streets, each of which leads to a house. Visiting each house yields an object; all but two of these objects are parts to a machine you're building. The others are bombs, which you have to drop into a pit in the lower-right corner before you get blown up. You have to apply a pattern to your exploration, because visiting a house twice renders a bomb that's very close to detonation. Your pattern is the main strategy; it's largely a memory game. When you find a machine part, you bring it to the blueprint at the bottom-center. It's a drawing of the Ammo Machine, a big gun straight out of Dr. Seuss. Simply walking over the outline of the part you're carrying inserts it. Once in a while, a goofy monster will wander out of the bomb pit and try to dismantle your incomplete machine. He's to be caught and thrown back down. Other bad guys include flowerpots that come to life and a monster that wanders the maze at random beginning at level 2 (which, admiringly, institutes a new maze). Once the machine's built, you walk to the lower-left corner and push a big start button. Then you gain horizontal control over the machine, hoping that one of the bouncy bullets suddenly springing from its spout will hit the bad guy before he catches up to your sweetheart. There's too much chance involved here; the firing pattern may be comical, but it's sporadic and unpredictable. The best action games have something panicky about them, and here, it's the creep chasing your chick: That's the claustrophobia, the thing behind this game's sense of urgency. The fire button speeds you up, but you have limited "fast-running time." The only thing that truly bugs me is that you don't get extra lives. Since it's all but impossible to beat a level with one life, you have to figure on using up a minimum of one life per level. You can see how this can get frustrating right around the third level! The game's a lot of fun, but its idea is a little better than its execution. -- Chris F.